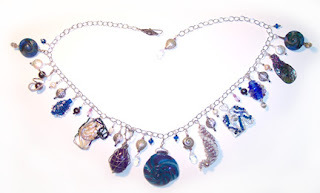 The collaborative necklace that my artist friends and I made in 2006 has been on its last date. It arrived back from its travels yesterday, and now I need to pack it up and ship it off to Belle Armoire for an upcoming issue on collaborations. In August, the necklace will be auctioned off to support breast cancer research. It seems like a long time from now, but you know how time seems to slip away! You can read more about the history and travels of the necklace if you click on the post label "A Charmed Life" project below.